Great Invention Idea? Cure Hiccups with a Zap! We've all heard that a good fright is one way to cure a bout of the hiccups. Admittedly, that's never worked for me, but I'm not the kind of girl who scares easily. (The nutrition label on a bag of Cheetos notwithstanding.) Well it seems back in 2003, Philip Ehlinger, Jr., in the style of a pre-Discovery Channel MythBuster, or an obstinate inventor, you decide, felt this urban legend was worth validating, so he came up with United States patent 7062320. I know what you're thinking; The Device for the Treatment of Hiccups looks a lot like a human feedbag - if only that were the case. 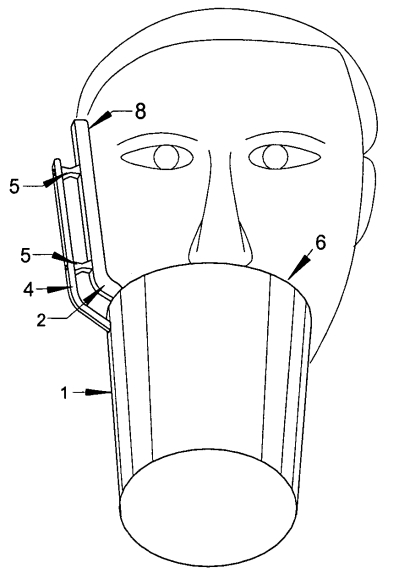 Basically, the device is a cylinder resembling a drinking glass that is strapped to the hiccup sufferer's face and is designed to shock them every time they drink from it! Supposedly, the shocks stimulate the nerves that control the hiccups. Get this freakin' thing off me! At which point the wearer, holding her breath in an attempt to fool the sensors, promptly rips the straps off her face and flings the device across the room. Or maybe the hiccup feedbag isn't meant to cure the wearer at all. Maybe the device is worn so that the afflicted happens upon the wearer, screams in terror and is immediately cured of those pesky hiccups. What about the electric shocks? What's a little voltage in the mouth when we are talking about potentially healing people? Seems Ehlinger was onto something. Maybe this urban legend, the hiccup fright cure, is legit. Or maybe Ehlinger got lucky. What do you think? 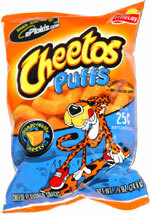 Better yet, hold that thought while I grab a bag of Cheetos. After all, United States patent 7062320 has shown me there are a lot scarier things out there than a bag full of fat and orange food coloring, unless of course, that bag is plugged into an electrical outlet and strapped to my face. Want Endless Bubble Wrap Popping At Your Finger Tips? It may work....lots of testimonials??? I suppose it must work or people wouldn't volunteer to be electrocuted (figuratively speaking)!